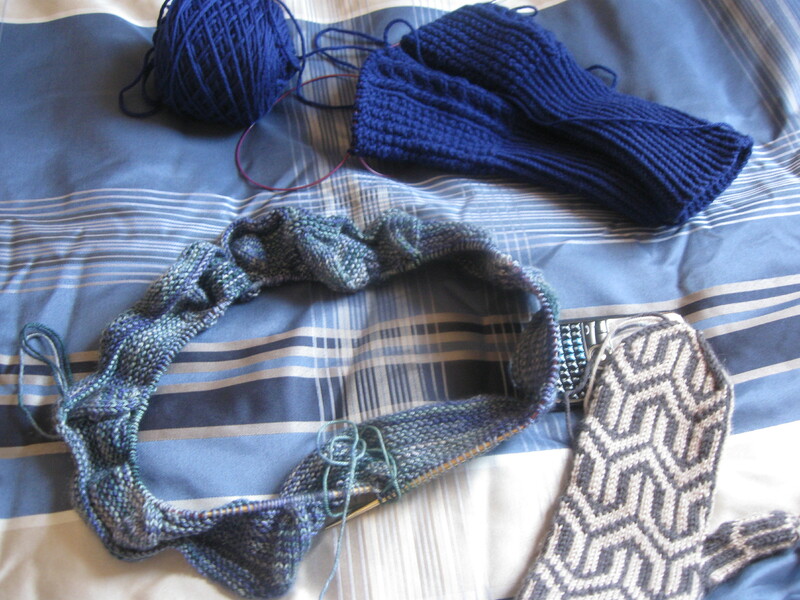 A snapshot of my current knitting projects, sleeves of my White Pine sweater (I finished the body) are the blue things (I’m knitting them two at a time!). The circular green/blue thing is a circle scarf in Bugga! I’m excited about this, it’s a new design. And finally a single mitten that I just finished, Mod by Kristen Kapur. I loved the pattern but I didn’t like the afterthought thumb, so that is of my own modification. I’m apparently relatively bad at blogging. I have been cooking though not much. My boyfriend’s mother is an awesome cook and we had gone over her house this weekend and come home with three nights worth of leftovers. I’ve honestly been somewhat blah about cooking, and baking, because I haven’t had much time to exercise, therefore too much baking isn’t good! More soon. I did go and get some interesting stuff at the Chinese grocery, and I will be cooking soon! This weekend, I made pizza. After the whole wanting to be a vegetarian, I bought many, many things that I don’t normally buy, which included baby spinach and fresh mozzarella. It turns out, that makes for a great pizza. I use a simple recipe for the dough, in my bread machine, then add dried basil and oregano and some garlic salt. After it finishes the dough cycle, I take it out, shape it, preheat the oven to about 400 degrees, and poke holes in the dough with a fork to keep it from bubbling too much. I bake the dough ALONE no toppings for about 10 minutes or until the bottom has browned when lifted up by a spatula, the edges should be browning as well. 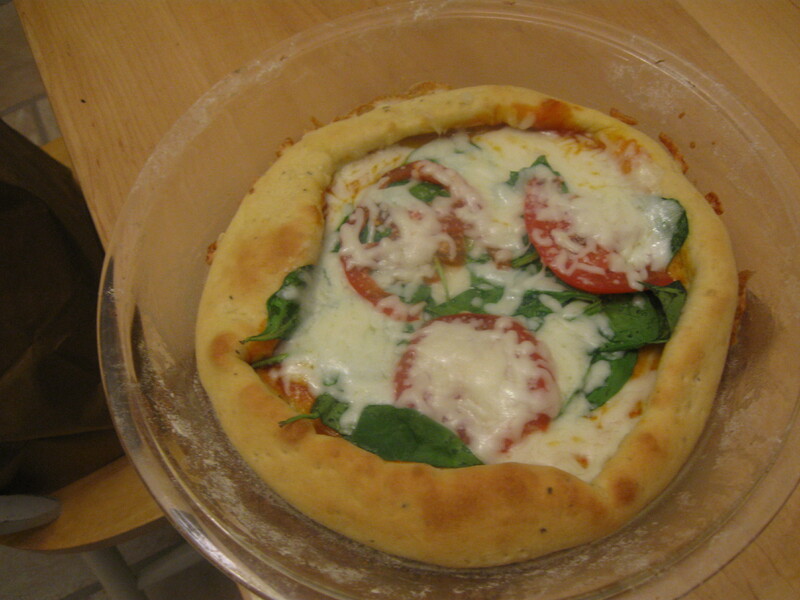 I take it out, brush the whole pizza, crusts and all with olive oil, then a light layer of sauce in the interior of the pizza and for my pizza, fresh mozz, then tomatoes then spinach, then a bit more shredded mozz. Cook that in the oven until the cheese starts to bubble and brown. I love making pizza because it’s pretty delicious from home yet not as greasy. This weekend I also when to a book sale at the library. It was the last day (and the last 20 minutes!) 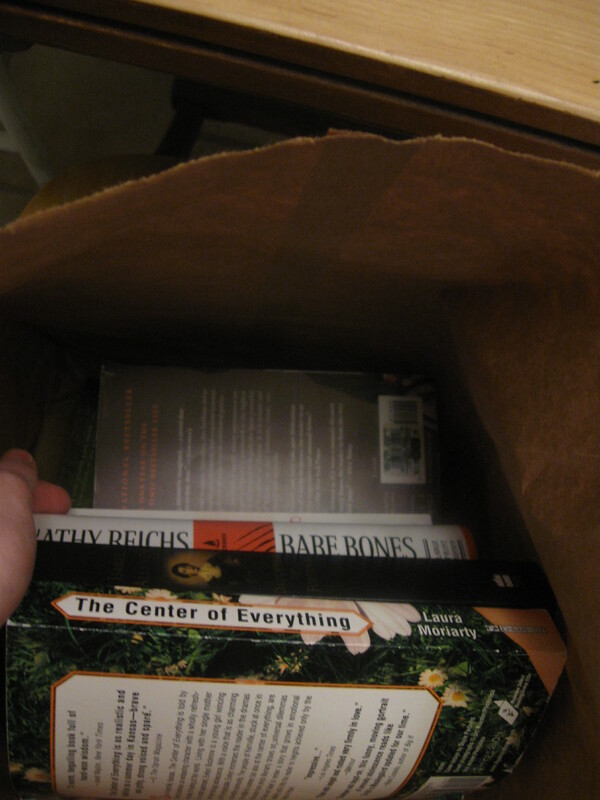 so it was this whole bag of books for $5. I even got a couple books I’ve been planning on reading! The rest I’m planning to either sell online or give to my family. It was a good weekend. I finished these socks. 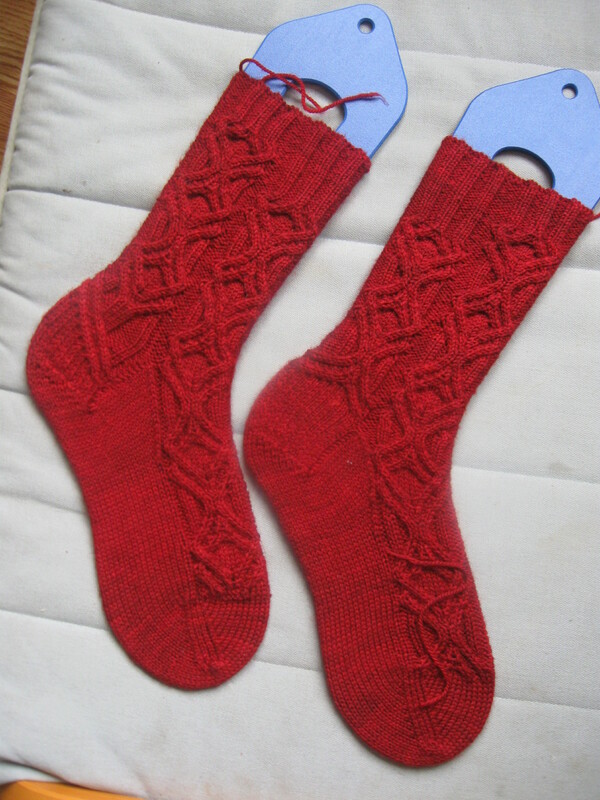 They are the Stalagmite Socks from Knit.Sock.Love. by Cookie A. They’re for my Nana, who is leaving today by her self with her dog on a trip to Florida from CT in a big truck and Gypsy caravan my grandfather built. I loved knitting them, though they are rather complicated at times. They did take about a month to make. I’m also currently knitting my sweater that never ends, and those mittens. I have a new design in the works as well, a circle scarf in Bugga! My boyfriend told me the other day that he thinks he would not get sick as often if we ate generally vegetarian. So, I looked up tons of recipes on Tastespotting, and picked out the one that used ingredigents that I mostly had and made it the other night. 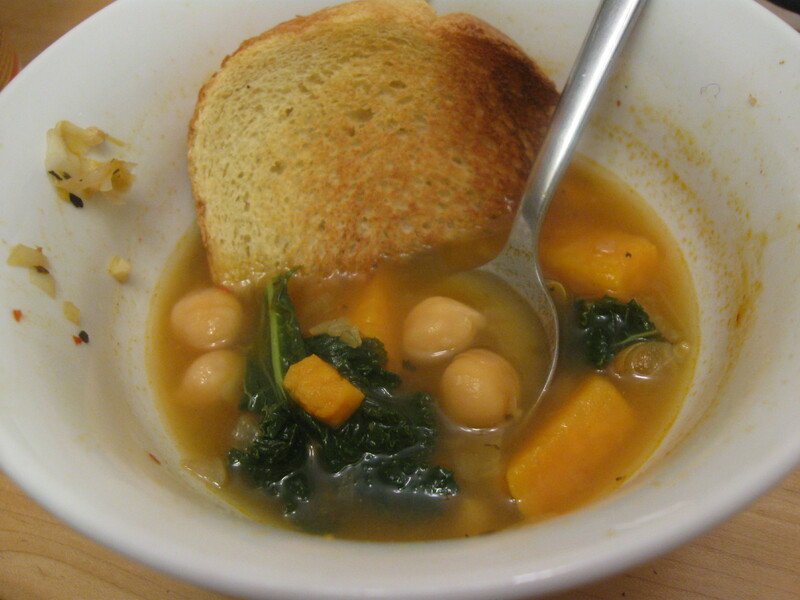 It was a soup of kale, sweet potatoes and chickpeas with broth, and you can find the recipe here. 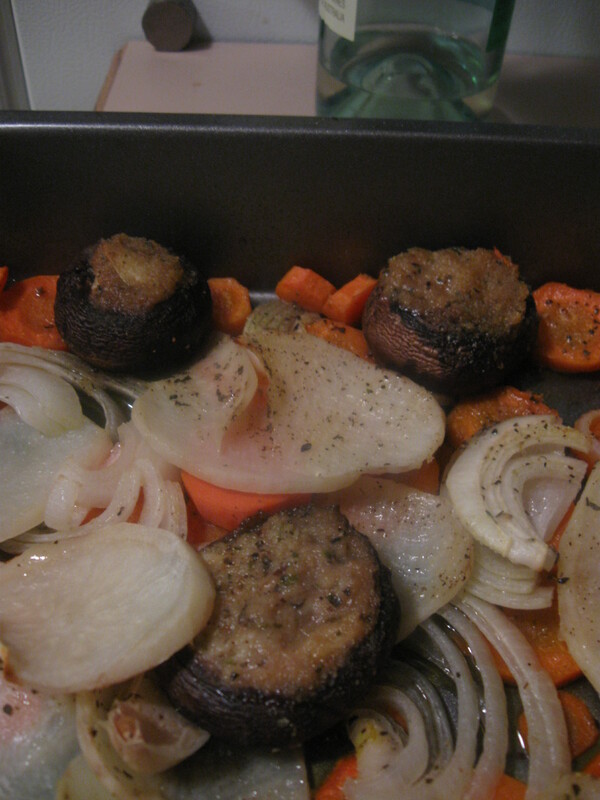 I was a bit nervous at first about making a recipe with no meat – with meat, you always know you have flavor somewhere, but I had underestimated the veggies. I also did use chicken broth instead of water because I was worried about the flavor of the soup. I used wine instead of beer, which I will not replace again because I feel like it was central to the dish, because my sweet potatoes and substituted wine did not get syrupy like the recipe said the beer would. Overall though, it came out pretty good. With toasted bread it was very tasty. Once again, more later about various food adventures. A quick post. 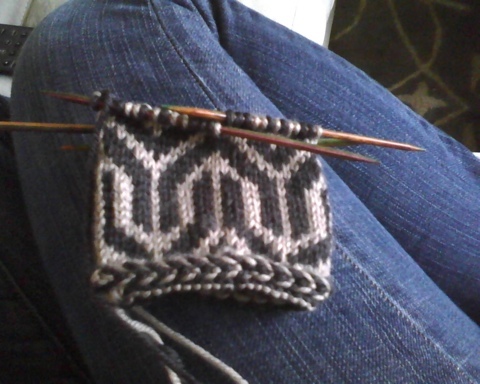 This is the beginning of my new mittens! So far I love them. One of the families I work for, the mother is a really good cook. She doesn’t cook for me regularly, but when she offers me leftovers, I take them. The first time, she heated up some frozen butternut squash soup she had. 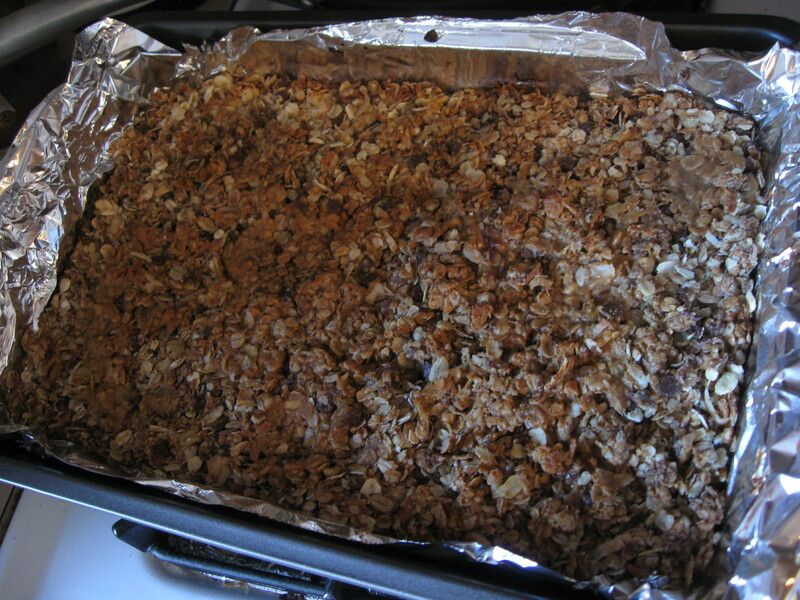 It was so tasty, filling and really good for you that I made my own at home (and I have the ingredients to do it again soon!). I do have to give her a lot of credit, because of just talking to her and absorbing information from her cooking, I’ve learned to cook more effectively (I am a better baker, and she appreciates me because of that). A month ago she made french onion stew with beef in the slow cooker, raved about it and had me prepare it for slow cooker one afternoon. She told me the majority of the recipe as I went, and then the next day, she gave me some of the leftovers. Again, all I could think about was making it for myself! 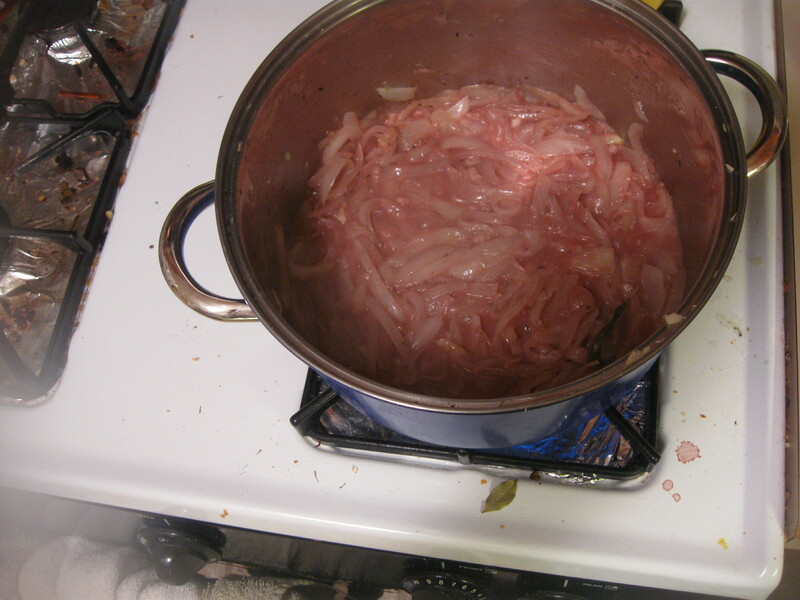 I looked up recipes and most only used onions and beef stock which I was fine with. Then that weekend, when I do most of my cooking, I was very sick but still wanted this soup and got some from panera which was multiple levels below her soup, but still so good. I tried making it a couple days later, because I had also apparently bought two bags of onions two weeks in a row! Way too many onions. I tried making it about a week ago. I was silly and though it was good, I didn’t caramelize the onions enough. You can see that they are still mostly white (With red wine coloring them) but they should have been mostly brown! If I just let go a couple minutes longer, it would have been fine. It was pretty tasty, but I also made it too thick. Eating it that night was fine but the next day it was too thick, mostly tasted just like onion soup, not the french part! It was a learning experience though: next time, make sure the onions are fully caramelized and don’t thicken the stock too much! 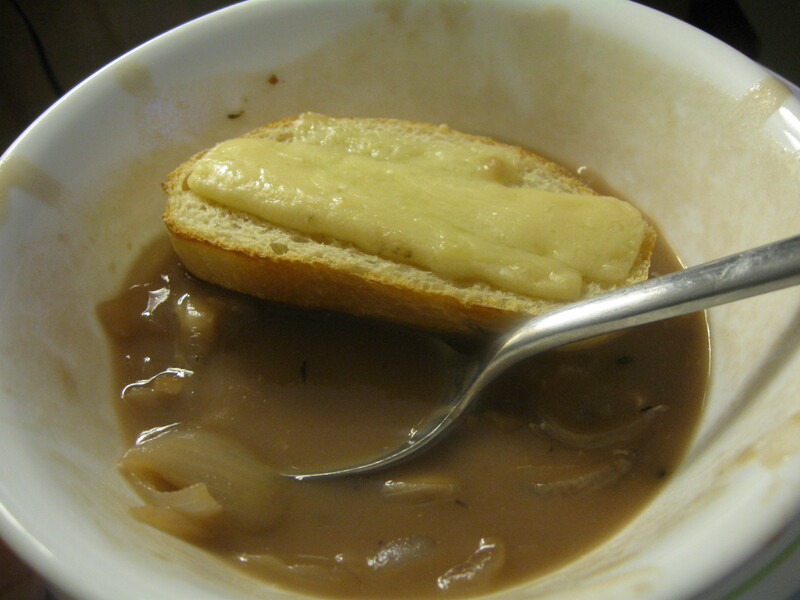 And I want to buy better cheese next time to put in the soup as well as melt over bread. I want to try this again soon though, I love soup and soup weather will soon be over. Does anyone have any yummy soup suggestions? Or ways to better my french onion experience next time? Me: Are you sure? It’s going to be dinner or cupcakes, not both. Are you sure you want cupcakes? Josh: Yes, unless you can make steak for dinner, I want cupcakes. And literally the best I’ve ever made. It started with this recipe for the cake part, then this for the frosting. 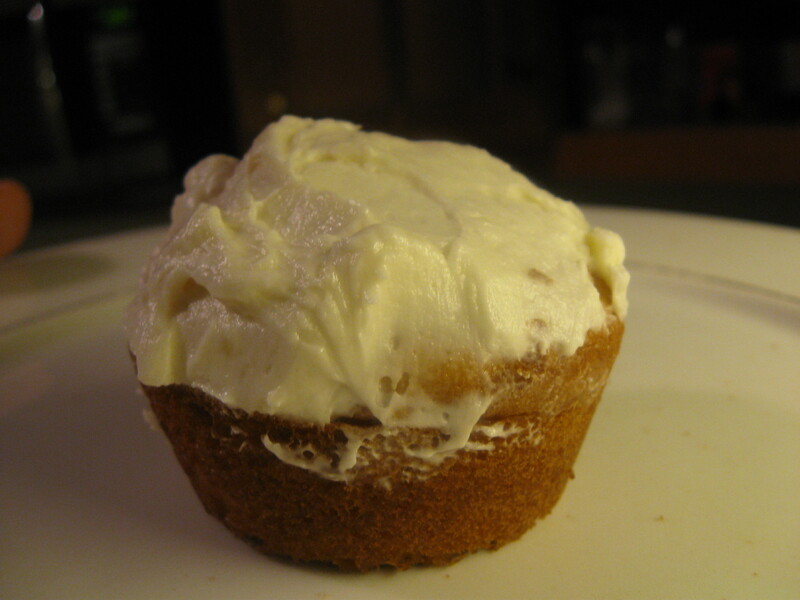 And, really the name for that recipe for the frosting is called “That’s the best I’ve ever had” and it’s true. I also like that it uses regular sugar because honestly, frosting is the only reason I have confectioner’s (powdered) sugar in the house. The cake recipe is really tasty as well, I think the extra yolk helps the recipe stay moist and yellow-y. The recipe has you whisk flour (I know) and milk on the stove until thickened, then add it (after it cools with vanilla) to a creamed butter and sugar mixture. Beat it until it looks like whipped cream. 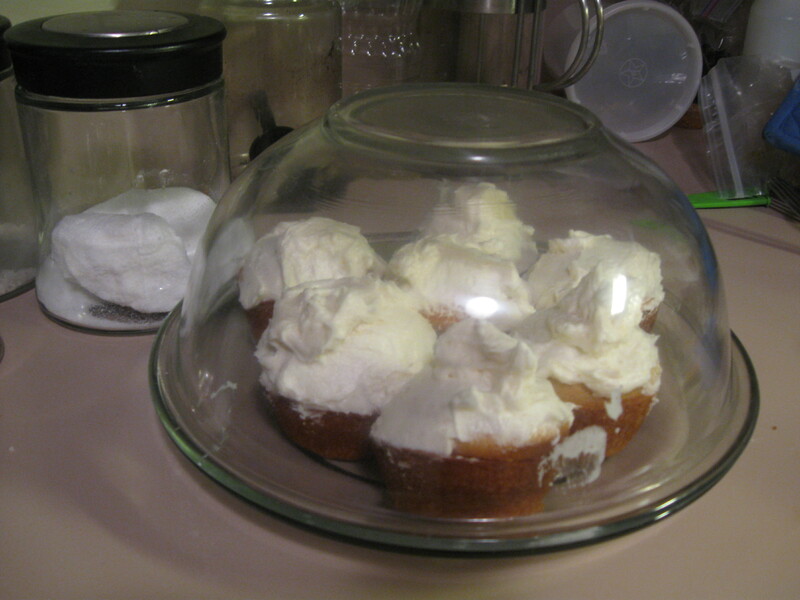 Then you taste it, and almost eat the whole bowl, pull all your willpower to just FROST the cupcakes without eating ALL the frosting, and then spoon some out of the bowl to eat. Then figure if you don’t put what remains of the frosting on the cupcakes, you will end up just scraping down the bowl with your tongue. 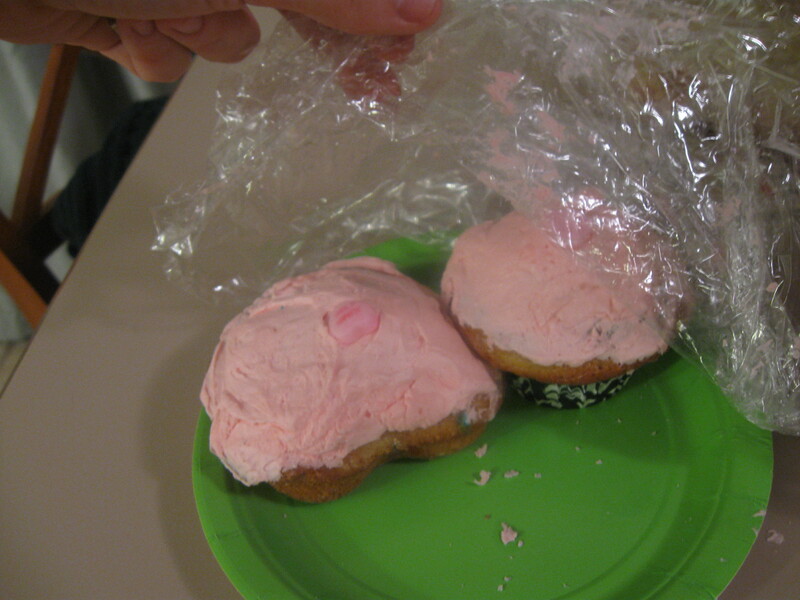 After that ordeal, I figured I needed to get rid of some of them before all of the cupcakes were in my stomach, so I gave some to the neighbors. Thank god for them. To make myself feel a bit better about this frosting and cupcake problem, I made roasted veggies for dinner. Sadly I put too much wine and olive oil on them so they were a bit rich (I know, how in the world did I do that?) but still tasty. I made quick, fake stuffed mushrooms by putting garlic cloves under breadcrumbs and pouring wine and olive oil over them, and they were not bad! Up next: Yarn, knitting, and LOTS of backlogged cooking adventures! Happy Valentine’s Day if it is important to you, for me and my loved one, we don’t care so much for it but apparently I made cupcakes anyways? I’m knitting a sweater currently, as well as several other things. I love knitting it but I keep plugging away for what feels like eternity without much progress! I want to finish it before spring so I can wear it a lot before summer, but I don’t know if I’m going to make it! Right now I’m in the simple, fun part of the sweater – pretty much straight knitting in the pattern, with a couple waist decreases or increases on the horizon. From reading ahead though, I can tell that soon, it’ll be more of a sit there and scratch my head type of pattern. I’m also working on a rather complicated pattern from Cookie A.’s book, Knit.Sock.Love. I’m amazed that I was able to somewhat memorize the pattern, but I did. It’s for my grandmother, and I’m trying to finish them soon because I want her to have them before the summer! Recently, I haven’t been doing a lot of cooking. I’ve been really sick, yesterday I was supposed to go to Northampton to go to Webs (the yarn store), with my good friend mullica and I had to call her in the morning because I was too dizzy to drive. I had had a cold but it hadn’t been that bad, until yesterday, were I fluctuated between dizzy and starving. I had gotten up in the morning and made chili in the slow cooker. Good, but I’m going to try again with a couple tweaks then post it up here. Today, however, I did make a couple interesting things. Which I don’t have a recipe for, because they were a jar gift that I got from a woman I worked with for Christmas. I don’t know if they will be good, they are still cooling. Today is the superbowl for football (American football), but I don’t have cable so I doubt I’ll be doing anything special. I might be going to my parents good friend’s house for a bit, but I’m still not feeling well. I’ll update later with more pictures of knitting projects. I want to blog consistently, so I’m going to try and set up certain days I post about certain things. It’s all very certain. So, for things that I’ve learned this week (the first! ): Cooking. I moved out with my boyfriend and good friend last summer. I was 20, I liked to bake and did so well but not so much cooking. There was trial and error – lemon pasta with too much lemon, fried rice with too much ginger, days were I had no idea what to cook but plenty of food, days were I had so many ideas but no food with no money to buy food, times were all we really had to eat was food our parents gave us, and let’s just say it’s been interesting. I hate getting take out as a way of life, and I’ve tried very hard to use my skills as a cook to make little food into delicious, and a relatively small (but now stable) income into consistently healthy and good cooking. For this, I had several challenges, the first being the whole income thing – two (and sometimes a third) college students with part time jobs don’t exactly make a lot of money for food. Second, the sad fact that I grew up in a stocked kitchen, with not only every type of broth and pasta was constantly stocked but every pan, pot and spoon used for anything imaginable was there. My mom would ask for cooking utensils for her birthdays and while originally confusing I now understand this. So imagine my surprise when I had to cut butter into flour with a fork and knife! And when I had to “cream” butter and sugar together by hand! No kitchenaid mixer to aid me! Last, was also a problem with the first – my new kitchen didn’t have any of the consistent stuff in to make dinner every night – I ended up going to the grocery store every night if I wanted to make dinner! 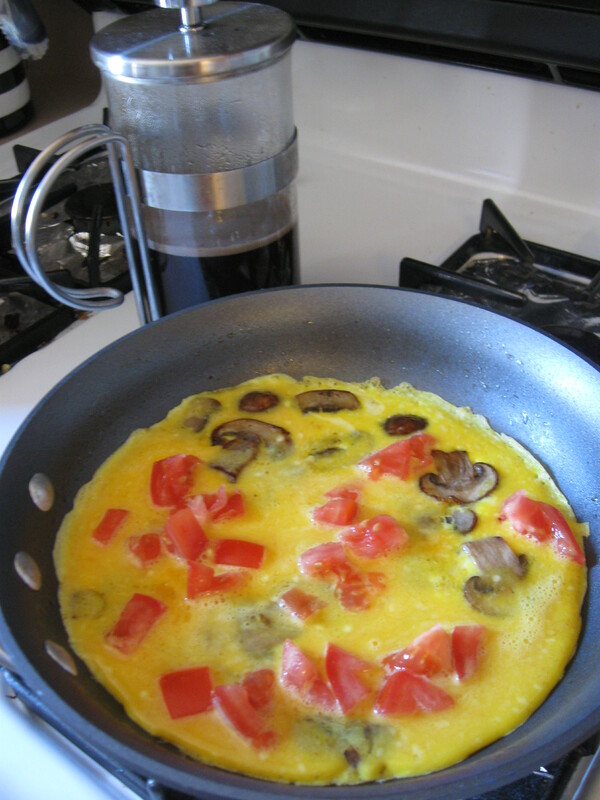 I wanted to make tacos – no taco shells, olives or lettuce. I wanted to make chicken Parmesan – no Parmesan! But now, from a combination of experience, calling my mom for advice I have learned that all I need consistently in the house are a few things and I can come up with dinner from those things. I always stock meat (I’m a meat lover as is my red meat loving boyfriend), broth, garlic, sauce, onions, eggs, and various baking things. I normally drink wine and love mushrooms. From that, I normally saute garlic and onions in olive oil, add some type of meat dosed in something (crumbs, wine, salt and pepper), make a sauce either from the wine and some broth or from a can, with spices, and add pasta. And while that’s not every night – that’s what I’ve noticed about 95% of recipes start with, saute garlic and onions until soft, then proceed. This, for me, was a discovery! And a happy one at that. My problem now (and I would love suggestions to remedy this): getting veggies into my diet with out having to make frozen veggies every night. 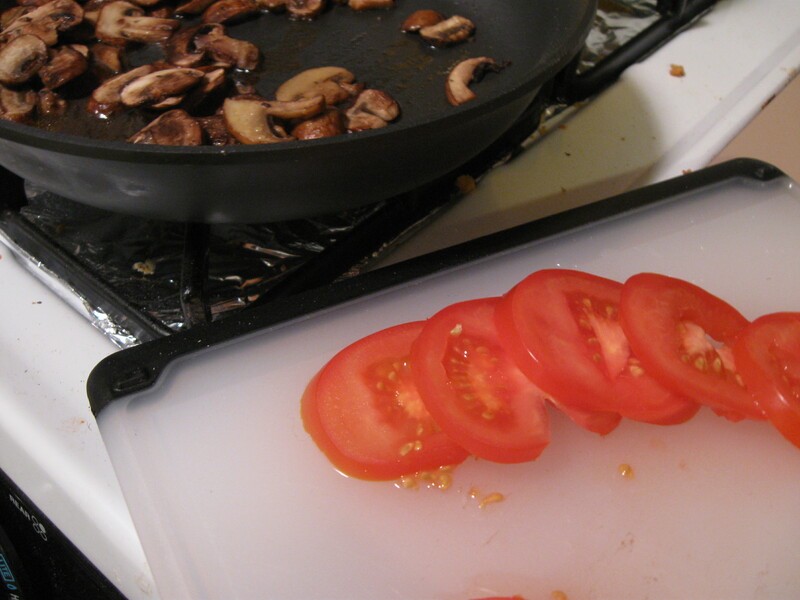 I do many dishes like fried rice (with less ginger) that have veggies in them without worry, I put tomatoes on my pizza, carrots in my quick coco au vin, etc. I’ve made butternut squash soup with tons of veggies and ate that for days, but are there any good recipes with tons of veggies but still a meal made together? But before I go: this website is awesome, and great for looking at for cooking or baking inspiration or when you want to make yourself really hungry.